Stockton Town FC was formed initially in 1979 under the football clubs previous name Hartburn Juniors. Although records around that time are sketchy, it would appear the club was formed by Derrick Small who at the time was coaching youngsters (under 10) from the Hartburn area of Stockton at the YMCA. A team was initially entered in the Acklam 5 a side league in Middlesbrough to give the youngsters at that time the opportunity to play organised football. Following on from the success of the 5 a side team it was decided in 1981 to enter an 11 a side team in the Teesside Junior Football Alliance (TJFA) at the under 12 age group. At that time there were a number of players who were under the age requirements for under 12 and they continued to play in local 5 a side leagues. It was at this time that the club home colours that remain now, yellow/royal shirts & royal shorts, was established. The 1982 season saw the introduction of a second 11 a side team to the TJFA and the clubs first sponsorship, which saw Willie Maddren supply part funding for clubs kit & hold summer coaching sessions for the players. The two teams finished 3rd and 8th in their respective leagues, with the first record of club players playing for the league representative side (M Small, R Lake, M Bashford & C Timney). In 1983 the club was invited to play in the STS Soccer Tournament in Belgium which they went on to win 5-0 in the final. The season started with 2 teams at U12 & U13 age group, with 6 players that season playing for the league representative side (R Lake, M Small, I Hutchinson, M Richardson, A Speight & M Sunley). The club started to steadily grow with 3 teams registered to play in season 1984/5. The first trophies recorded were also won with the U13’s beating Stockton West End in the Stockton Youth Cup. Notably the U12’s reached the league cup final and the U14’s the North Riding County Cup Final. The following season the U14’s went on to win the North Riding Cup Final beating Marton 3-2. Lee Roxby made the final 20 in selection for England Schoolboys, only one of two players selected from the North East. During this period the club had their first success with players moving on to join professional clubs; Mark Sunley – Middlesbrough, Ian Hutchinson – Halifax, Chris Hope – Darlington & Rob Lake – Middlesbrough. In 1986 the club took a step backwards in terms of team numbers with only one team being registered with the Cleveland Youth League. Derek Small the initial founder resigned from the club and Mike Ranson took up the mantle of running the clubs only team with a couple of willing parents. By 1989 the club was on the up again, with an U10 & U14 team, the U10’s going on to win the League Trophy that season. The club steadily grew to six teams in 1991 with U10, 11, 12, 13, 15 & 16’s. It is unclear from current records when the clubs constitution was first introduced or who were involved with executive committee of the club. However, it is recorded that in 1993 Peter MacLean became the Club Chairman, with the club continuing to run with 7 teams U10 through to U16. During Peter’s reign as Chairman the club were voted TJFA Club of the Year in 1994. In 1998 Peter MacLean resigned as Club Chairman to move over to the TJFA and Maurice Bell took the reigns as Club Chairman. Under the Chairmanship of M Bell the club grew from strength to strength. In 1999 organised mini soccer was introduced to junior football and Hartburn Juniors grew to 10 teams with the introduction of 3 mini soccer teams at U10 age group. Around this time the FA had released initiatives whereby they were looking to encourage junior clubs to introduce coach & club development. Hartburn Juniors enrolled their first coaches on the FA Coaching Certificate, with Gary Sudron becoming the clubs first level 2 coach in 1999. The following year this was followed by Alan Brown & Neil Turnbull obtaining the same award. The club began a fairly steep development project with the aim to obtain the FA Charter Standard for Clubs which was successfully achieved in 2002. In 2003 the club also had success in terms of coaching with both Gary Sudron & Alan Brown obtaining their FA Coaching Licence, UEFA B. In terms of club development, it was felt by the members of the club at that time that the club name didn’t really reflect the area whereby most players came from. The club had grown from predominantly having players in the Hartburn/Fairfield areas of Stockton to players who came from all over Stockton and in fact from Billingham, Middlesbrough & Thornaby. It was therefore decided in the best interest of the club to change the clubs name to STOCKTON TOWN FC. There was also a desire within the club to try to resurrect Stockton Town as senior football club and it was felt a great development opportunity to achieve this from grass roots through a junior football club. In the clubs first year as Stockton Town FC, 12 teams were registered with local leagues giving over 170 youngsters the opportunity to play organised football & benefit from the professional coaching that was available. In conjunction with the FA, STFC hosted a level 2 coaching course at Stockton with 7 members successfully obtaining their First 4 Sport Level 2 Coaching Qualification (FA Coaching Certificate). The club were successfully awarded FA Community Club status in early 2004. In 2005 Stockton Town had unprecedented success off the field of play. In April 2005 they were voted Stockton Sports Club of the Year, by an independent panel commissioned by Stockton Borough Council Sports Development Office. This was closely followed in June when the club was voted Durham FA Community Club of the Year 2005. The following month Alan Brown was voted both County & Northern Region Grass Roots Coach of the Year 2005. As one of 9 Regional winners Alan then attended an interview panel at FA Headquarters in Soho Sq. and a few weeks later was voted National Grass Roots Coach of the Year 2005. The awards didn’t stop there, in August the club were chosen as the Northern Region Community Club of the Year 2005, one of only 9 awards presented nationally. Our Ex Chairman Alan Brown who was FA National Grassroots Coach of the Year in 2005, seen here being presented to the Chelsea and Arsenal teams prior to the 2005 Community Shield, as Guest of Honor. On the playing side ex Hartburn/Stockton Town player Jonathan Franks, who had moved onto Middlesbrough FC Academy was selected for England U16’s where he made his debut in September v Wales, scoring twice to become the first Stockton Town player to represent & score for his country. In the same season Jonathan went onto to play senior football for Middlesbrough Reserves (age 15) and play for England a further 5 times, scoring 4 goals in total. “Franksy” represented England in the U17’s World Cup in South Korea reaching the Quarter Finals and beating Brasil 1 0 along the way and the following year the U18’s UEFA Championship where they reached the semi-finals. After being released by Middlesbrough during Tony Mowbrays reign, following a series of niggling injuries Jonny went on to enjoy 3 seasons at Hartlepool United playing a leading role in the Clubs great escape from relegation. In the summer of 2015 Jonny joined Scottish Premiership side Ross County. The 2005/6 was a season of further expansion within the club with the introduction of 2 girls teams (U10 & 12), The club stared the season with 10 junior boys teams, 2 girls teams & an over 35 team, giving the opportunity to play football to almost 200 children & 20 adults. In April 2008 the Club underwent a massive investment totalling £1.4 million pounds that saw a partnership with Stockton Borough Council, Stockton 6th Form College and Our Lady & St Bedes School develop the facilities at the Site. This development was the springboard for a further expansion for the Club. This development also saw the Club introduce its own Football Development Officer whose remit was to build our community presence by building Club – School links and such was the success of Andy Burton in this role that he won both regional and national recognition of his work. One of the next steps for Stockton Town was to introduce Open Age Men’s Football to the Club. Stockton Town had proved very successful in producing top quality young players that then went on to play for various other local non-league teams. The Club decided it wanted to give these youngsters an opportunity to stay within the Club if at all possible. So for the Season 2009/10 Stockton Town entered a team in the Teesside League 2nd Division, with a management team of Martin Hillerby and Gary Sudron and made up with a majority of teenagers Stockton Town proved worthy competitors. Their 1st game in Senior Football was an away fixture at St Marys College which saw a 2 1 defeat with Evan Ditchburn claiming Stockton’s goal. Having led the League for most of the Season they faded in the spring to finish a creditable 4th. The Club and the Players were keen to progress and the summer of 2010 saw Stockton Town apply for membership of the Wearside League, which operates at Step 7 of the National Pyramid. The Club were successful in their application and quickly appointed Gary Hinchley to the position of Team Manager. Gary Hinchley in his Guisbrough Town Playing Days. Gary quickly recognised that the Club’s youngsters needed some experience and guidance around them which saw ex professional and non-league stalwarts Adrian Swan, Matty Hyson and Micky Waller join the Club. In the Wearside League the team struggled, in the inaugural season of 2010-11, but finished a creditable 10th spot after a very impressive run of results after the Christmas / New Year break. Stockton Town improvement continued the following season, with a 3rd place finish and a Wearside League Cup final appearance. However Stockton’s opponents in the final were League Champions Ryhope CW who beat Stockton 2-0 to lift the Trophy. The summer before 2012-13 season brought change to Stockton Town with Gary Hinchley stepping aside due to work commitments and his Assistant Stephen Gill took over as manager. Stockton Towns continuing improvement saw them lift their first ever Trophy in senior football with their first league title. The Championship was won with an incredible run that saw the Club win their last 12 League games to pip Willington by just 2 points. The Wearside League Trophy currently on display in Stockton Town’s Clubhouse. The 2013-14 was by far Stockton Town’s best season, a 2ndLeague title, a 2nd Cup final and individual League honours. For the second season running, Stockton Town topped 100 league points, finishing with a league record 104 points, with a 129 league goals total this was a club record at this level. Stockton reached the Monkwearmouth Cup Final, with Ryhope CW again the opposition the outcome was also the same another 2-0 defeat. Individually the club had a clean sweep, with the Goalkeeper Golden Gloves award, going to Michael Arthur who had an average of 0.61, in his 31 league appearances. Stockton Goalkeeper Michael Arthur won the Wearside Leagues Golden Gloves Award for the 2013/14 Season. The Wearside Leagues Golden Boot Award went to Kallum Hannah, Stockton’s Centre Forward who scored an impressive 48 goals during the campaign. Kallum Hannah who won both Stockton Town’s and the Wearside Leagues Golden Boot Award for the 2013/14 Season. Kallum is also Stockton Town’s all-time leading goal scorer with 80 goals from 110 senior appearances for the Club. 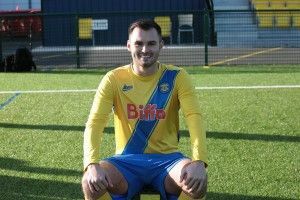 Adam Nicholson is Stockton Town all-time leading appearance maker having appeared for the club 283 times currently at Dec 2017. Adam is another player who has progressed through our Junior Teams and made his debut in the first team at age 16, Adam is now the Club Captain. In 2014-15 the Club completed the clean sweep of Wearside League Title, League Cup, Shipowners Cup and Monkwearmouth Cup, a feat achieved only twice before in the long history of the League, the team were unbeaten in all competitions and missed out on a ‘perfect’ season when losing their second last League game away to Prudhoe. The next season saw a 4th consecutive League Title along with the League and Monkwearmouth Cup’s back in the Bishopton Road Trophy Cabinet. During this period the Club had worked tirelessly to improve their facilities to the standard required for promotion to the Northern League and this was achieved in the Spring of 2016 when the Club opened it’s 3G Stadium facility. Stockton Town’s Junior Teams and Players have also continued to flourish in recent years. A very significant achievement was by Sonni Coleman who during the summer of 2014 was selected for England U18’s Schoolboys. Sonni represented England in an International Tournament taking place in Northern Ireland and not only finished the Tournament as leading Goal scorer but also collected the Man of the Match Award for the game against Wales. Sonni Coleman pictured below who has been selected for England U18’s Schoolboys and has recently made his debut for Stockton Town’s 1st Team. One of our players on this list recently made his 1st Team debut for Hartlepool United at the age of 17. Kieran Green joined Hartlepool when he was 15 after playing all his junior football for Stockton Town. Kieran had been involved with the 1st Team during their pre-season during the summer but has since gone on to start the Johnstone’s Paint Trophy game against Sheffield United. In the following weeks Kieran has maintained a place within the squad and has been named on the bench on a number of occasions. Kieran Green in action for Hartlepool United on his 1st Team debut against Sheffield United at Victoria Park.